One of the questions I get from my readers recently is how to get free website traffic from specific geographical regions or countries. This question came up because in this post, I made it clear that some advertisers are very much interested in geographical source of our traffic before making up their minds to buy space on our blogs. So I said to myself instead of giving individual answers to mails and comments, creating this post will be a better idea to respond to the queries once and for all. An Indian blogger who is physically located somewhere in his country can effectively create a blog that gets more of its traffic from US or Canada or any region other than where he is. People have businesses that target specific markets in specific regions. Local businesses like restaurant, supermarkets, hotels, etc may want more exposure in their geo areas of coverage. Hotels in Galveston Island or Alvarado in Texas may not be interested in travelers to some other cities or states, for instance. People in different geographical locations generally have different purchasing power and facilities. Africa for instance is generally known for it lack of online payment facilities and low purchasing power. This also is true for most Indian and Asian bloggers. USA, Canada and most European countries on the other hand have more developed societies with facilities that encourage online spending. In order to make more sales and profits, most businesses may want to get their products exposed to markets in areas with bright business representation. But globally, these 2 countries are barely scratching the surface. The bitter truth is, if most of your traffic is coming from Nigeria or Cameroon, you are going to be very unsuccessful attracting advertisers to your blog. 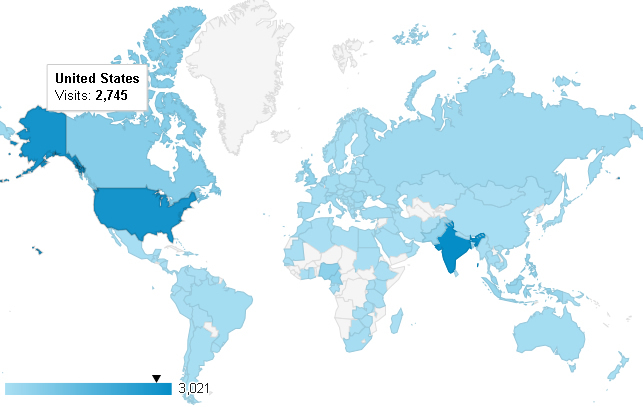 While blogging from Douala in Cameroon, I have more of my traffic coming from USA, UK, Canada, India. How do I get more readers from these areas? This is the best way (in my opinion) to attract readers from a certain region. You have to create the kind of content that will attract them. The more local content you publish, the more local readers you get. Think of business like car repair shops in columbus ohio. That’s a typical keyword that can bring huge local traffic from columbus ohio. Now if you are an automobile blogger, it will be very easy to create a blog that pulls traffic from a certain city. That means you can have huge business with car repair shops, car rentals, car sales, etc in that area. You may want to create a blog dedicated to restaurants in Atlanta, for instance. That alone is a hot keyword that can pull huge targeted local traffic. Simple! Visit the restaurants, conduct interviews, write about their menus, environment, facilities, etc and before you know it, you’ll be having a huge and hot database of restaurants in that area. Ain’t you seeing big business in this? If you want more of your traffic to come from the US, for instance, apart from providing content that attracts US readers, be active on other blogs that have US readers. The more you drop reasonable comments on these blogs, the more you expose yourself to the readers in this area. This of course will help you get more traffic from them. You can create Twitter accounts that only get followers from specific countries. This may be a time eater but gradually and with time, it’s possible to have an account where 90% of your followers come from a specific region. That means each time your post is shared to that account, you are sure to have traffic tied to that area. There are lots of Twitter apps out there to help you create accounts with supper geo-targeted followers. I do not have any to recommend at the moment. If you have any suggestion, please drop the name in the comment box. These are some of the ways you can generate free traffic from specific geographical locations. Well, this is about the easiest way to gain traffic to your blog or e-commerce store from highly targeted locations. Most PPC (social or search), PPV, etc have the facilities to help you target countries and cities. This will enable you create campaigns that will only expose your products to dwellers of specific regions. Now, for bloggers in niches that target a broader audience and may not require any form of geo targeting, I think there is still need to be interested in traffic from certain areas. In Internet Marketing and make money online niche for instance, if you want to attract advertisers or Adsense ads with high CPC, you’ll need to show interest in traffic from the United States, Canada, etc. That’s just how it is! Do you think you need free targeted website traffic to your website or blog? What are the methods you have in place to get more traffic from desired locations? If you are an advertiser, do you think it’s important to buy space on any popular blog without paying attention to geographical traffic sources?